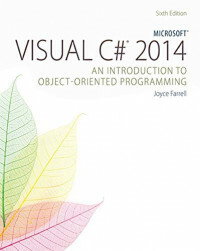 Develop the strong programming skills you need for professional success with Farrell's MICROSOFT VISUAL C# 2015: AN INTRODUCTION TO OBJECT-ORIENTED PROGRAMMING, 6E. Approachable examples and a clear, straightforward style help you build a solid understanding of both structured and object-oriented programming concepts. You master critical principles and techniques that easily transfer to other programming languages. This new edition incorporates the most recent versions of both C# and Visual Studio to ensure you have the contemporary skills required in business today. Short "You Do It" hands-on features; Video Lessons for each chapter; and a variety of new debugging exercises, programming exercises, and running case studies help prepare you for success in today's programming environment.